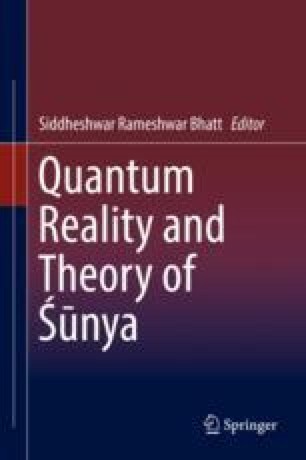 There is an obvious analogy between the concept of the vacuum state in quantum field theory and that of ‘emptiness’ or Śūnya. When the mind settles down in meditation to the state of pure consciousness, it has lost all content, all feelings and all emotions, and qualia or qualities also disappear. Some describe the state as fullness, a ‘field of all possibilities’, while others emphasize its lack of content. As the Bhagavad Gita, II.45, puts it, ‘nistraigunyo bhavārjuna’, ‘be without the three gunas’. Only from a state of purity of the heart and mind can a human fully realize his or her potential and act fully in accordance with all the laws of nature. Our approach shows that such a state is empty of wave functions or quantum fields and that the human mind achieves a state where all such excitations are annihilated. Potter KH. Nāgārjuna and Mādhyamika Buddhism (from Presuppositions of India’s Philosophies). Westport: Greenwood Press; 1976. http://www.advayavada.com/nagarjuna-and-madhyamika-buddhism-potter/. Six Yogas of Naropaand Niguma. Available at: www.maha-kala.com/archive/naropa/naropa101.htm. Deutsch D. Quantum theory, the Church-Turing principle and the universal quantum computer. Proc R Soc A. (1985)400 (1818):97–117. Doi: https://doi.org/10.1098/rspa.1985.007.